The Glacier Trust - Can we grow Hazelnuts commercially in Nepal? Can we grow Hazelnuts commercially in Nepal? Climate Change adaptation in the Himalaya's requires a strategic approach. As the seasons become less predictable and temperatures rise, the precariousness of traditional subsistence farming becomes more acute. A strategy that is gaining popularity through our projects is the cultivation of high value 'cash' crops. We have reported several times already on what is quickly becoming a coffee growing revolution in Deusa, but it isn't the only crop being grown in this beautiful corner of Solukhumbu. 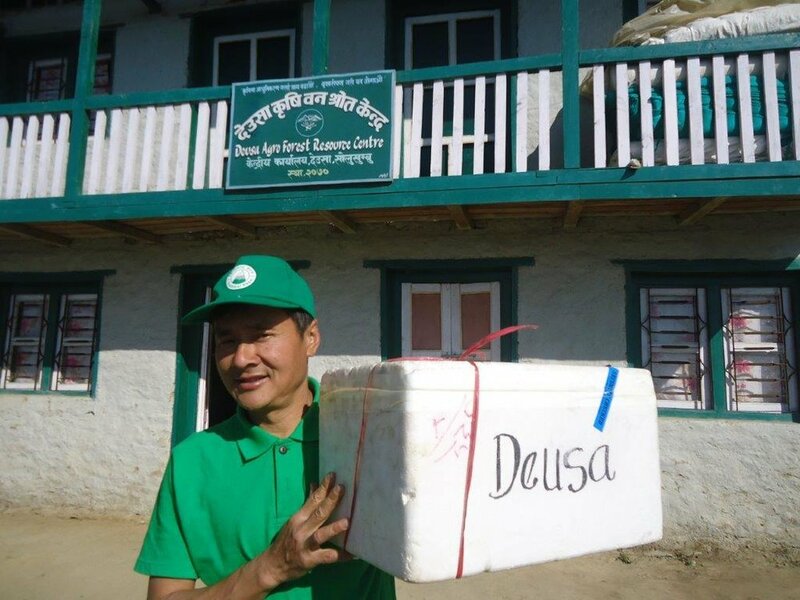 In this article, agricultural expert and our Co-Director and in Nepal, Richard Allen, explains why The Glacier Trust, EcoHimal Nepal and the Deusa Agro Forestry Resource Centre are trialing Hazelnut production in Solukhumbu. In an effort to diversify the crops grown by the farmers of Solukhumbu District, The Glacier Trust has begun to introduce hazelnuts to the potpourri of tree crops supported by The Glacier Trust’s Agroforestry Resource Centre (AFRC) in Deusa. 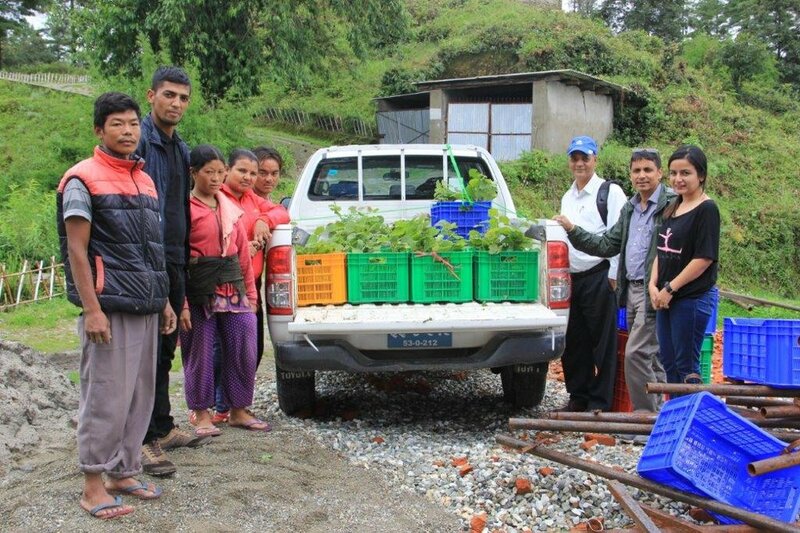 Deusa AFRC manager Keshab Rai receives first batch of Hazelnut seedlings in 2017. On the domestic front, Nepal imports 90% of the nuts consumed in the country, and there is a small market to satisfy. In the 2016-17 fiscal year, Government data recorded that fruit and nuts worth a staggering Nepali Rupees 11.23 billion were imported into the country – currently equivalent to £76.40 million. There is a huge cash-crop opportunity for the farmers here in growing tree crops, there are environmental advantages, and after the first few years, orchards and plantations are generally easier to manage, requiring less labour and time – this is so important as across south Asia, there is rural to urban drift of young people, less labour available on the farms, and in Nepal in particular, many of the young men have gone abroad for paid employment. The hazelnut is a very interesting crop and has a big international market which is booming (next time you are in the supermarket, check out the number of chocolates that have hazelnuts in them, and the sales of Nutella and other spreads etc.). Turkey produces around 75% of the world’s hazelnuts – but the orchards are old, not very well managed and productivity is declining. Hazelnuts, kattus in Nepali, grow at altitudes between 1,600 and 3,000 metres above sea level in the Himalayas, and after the first three years, are relatively easy to manage. In those crucial first years, it is important to protect them from browsing by stray cattle and wild deer, and to irrigate them once a week during the dormant winter period between December and February. After that, it is relatively plain sailing as serious diseases, such as the eastern filbert blight that has affected orchards in Oregon state in the USA, are not present in south Asia. Although an indigenous variety of hazelnut exists in Nepal, there are no commercial orchards of either indigenous or higher yielding varieties. 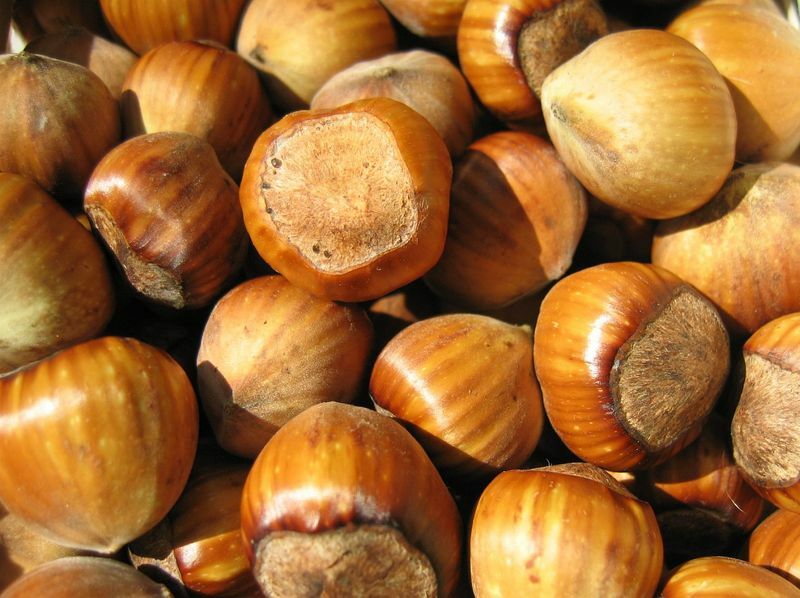 Besides the economic reasons, hazelnuts are a tasty, healthy food product that is well-suited for growing in the Himalayas. They have many uses, from nut-spreads and chocolates to savory dishes and salads. These tree nuts are high in protein, healthy unsaturated fats (primarily oleic acid), thiamine, manganese, copper, vitamin E, vitamin B6, and antioxidants. Hazelnut trees are thriving in Bhutan’s pristine conditions, and we are confident they will also thrive in the rural mid-hill areas of Nepal with the clean mountain waters, fresh air, and good soils, the great majority of which are undamaged by the use of fertilizers, pesticides and herbicides. Through contacts I made when working for the Mountain Hazelnuts Project (MH) in Bhutan during 2016-2017, and a former Trustee who earlier worked in Nepal, arrangements were made with MH management to import 1,000 hazelnut saplings to Nepal in late 2016 to carry out trials in four different parts of Nepal, one of which was our Solukhumbu-Deusa AFRC site. Mountain Hazelnuts Project is a private-public partnership, and the first MoU with the Government of Bhutan was signed in 2009. Since then, it has grown from a small business to the biggest employer in Bhutan (excluding the Government) with 800 staff employed and over 120 field staff stationed throughout the country in the 18 districts where hazelnuts are now planted and growing well. In addition, 1,200 people are engaged in support services related to MH operations, this including private trucking, local businesses, and construction companies. First small harvests were collected in 2016 and 2017 from the trees planted in the early days in the east of Bhutan and the first of four planned processing factories is now up and running - the nuts are collected by MH and once harvests are significant, premium nuts will be exported to the main world markets. Generation of tax revenues in US$ for RGoB through export of nuts. MH very kindly and with great enthusiasm organized the export and import and transportation of hazelnut saplings from Bhutan to Nepal. The original germplasm material is prepared in laboratories in Kunming, China and then exported to Bhutan, raised to the seedling stage in the MH nurseries and then acclimatized through different nurseries at increasing altitudes before being delivered to the farmers. 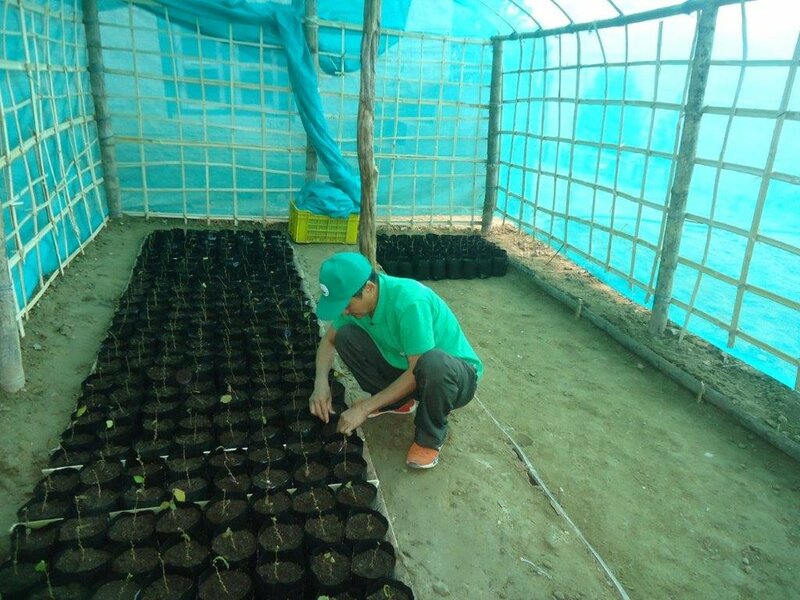 The 1,000 seedlings from Bhutan arrived in Nepal in December 2016, along with senior MH research staff member Sonam Rapten, who along with local resource persons supervised the transportation of the seedlings to four pre-arranged sites in different parts of Nepal and acclimatized there before being planted out. 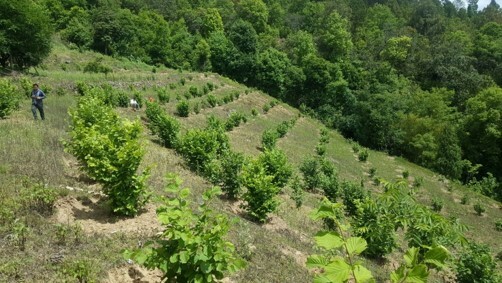 One of the selected sites was TGT’s AFRC in Deusa, Solukumbu, where the seedlings were well cared for under TGT’s Integrated Sustainable Tree Cropping and AFRC Programme by AFRC manager Keshab Rai and Agriculture Technician Hari Kumar Karki – survival and growth condition are regularly monitored, and irrigation, manuring and weeding provided as necessary. Employing the instructions and training from MH staff, 430 hazelnut seedlings were planted out into orchards during the second half of August 2017. At the time of writing, 93% of the planted trees have survived, as we approach the seedlings second monsoon season. Hazelnut plants are transported from Deusa AFRC to the field where they now grow in a small protected orchard. The AFRC is working closely in the project area with the Prime Minister’s Agriculture Commercialization Programme (PMACP), which has shown great interest in the development of the hazelnut trials and demo orchards. AFRC Manager Keshab Rai has recently been selected as chairperson of the PMACP and is playing a leading role in exposure and communication, with farmer to orchard visits being arranged on a regular basis. With the possibility that MH in Bhutan will expand operations into Nepal in the medium term future, our farmers in Solukhumbu may well be ahead of the game and lead the way in this exciting new venture.